Hollybeary Creations : NND January Sneaks Day 2!! NND January Sneaks Day 2!! It's Day 2 of our January Release sneaks and today we are featuring the fun new set Sending Hugs and it's Coordinating dies. I created a watercolor Wash background with some Distress Oxide Ink and then I die cut the panel with the Frames and Flags Die set. I adhered it to a Teal Card base and then I stamped the sentiment in Black ink. I stamped each of the images onto some Copic X-Pres It blending cardstock and colored them in with Copics. I used the coordinating dies to cut all the images out. I attached them to the card front with some foam tape. 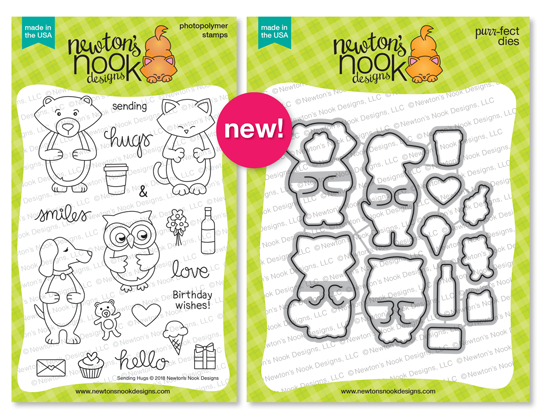 This is a fun set because each of the images arms have a cut in them to add special gifts. that kitty and owls are super cute! hold something. Your card is darling. This new set is so cute! I love all of your animals holidng birthday goodies! Your card is wonderful! I love the watercolor background and how your coloring has brought these sweet little critters to live. So sweet the way they hold things and give hugs!!! Your background is fun and I love your choice of colors. Thanks for the super inspiration. Adorable critters and I like the background. Aaaaaw, I love them! All of these critters are so cute! Of course, I'm partial to Newton :-) Adorable card! Super dooper, Uber cute. Just can't get over how cute these little guys are and that clever die set. What an adorable trio of friends! I love the color on that background too! So pretty! I love your background and the lovely scalloped border! These guys are so cute!!! Super cute! I love all the props the critters can hold! Your colouring of the critters is just lovely. Thanks for the inspiration. What a sweet trio with their paws/wings clinging onto sweet goodies! Adorable card! Love the little trio of critters. Fabulous coloring and awesome background. Cute card,Love the teal background. I love the background and the little critters are so super cute! TFS!!!! I absolutely love the Sending Hugs Stamp, super cute. Love your cards too!! So adorable. Love the die cut arms... brilliant design. Oh my goodness, look at these cuties, all coming bearing gifts! So fun! Love how versatile this set is! You've really done a great job showcasing this set! Such a cute card! I love your background! Love with what you dud here with this sramp set!!! That’s a super cute card ! These three little lovers are soo adorable !